We went for the reenactment of the Battle of Corricks Ford. William Corrick was Mike’s great-great-great grandfather. He owned property near Parsons, WV. As the Confederates retreated at the end of the Battle of Rich Mountain, there was a battle, or skirmish, between ten Confederate infantrymen holding the rear line with their general, Garnett and the pursuing Union forces. The general was killed. His body was brought into the Corrick home. The home was used as a field hospital. The reenactment was great! My grandfather, Gerald B. Corrick, told a story about the family being chased up the hill when the battle broke out and that the dining room table was hit by gunfire. Sure enough, Melanie, a cousin has the table! It has a bullet hole and corresponding damage to the leg from what looks like a Minnie ball hit! Parsons is a nice, small town. Check out the Railroad Depot and railroad bridge turned into a pedestrian bridge. The WV State Parks are fantastic! 6. Blackwater Falls State Park is one with an amber-colored water fall. 7. The food at the Battle of Corricks Ford reenactment was amazingly good. We’d strongly recommend the crab cakes from Parsons Country Inn and the chicken from the local service club. The cabins in the WV State Parks are fantastic! Several have old CCC cabins which are really wonderful pieces of stone and log construction. Try for last-minute one-night stays at the parks: we were able to get five such nights at different parks with no advance reservations! 9. At some of the cabins and state park restaurants, you'll find state china! It's reminiscent of railroad china -- much fun! 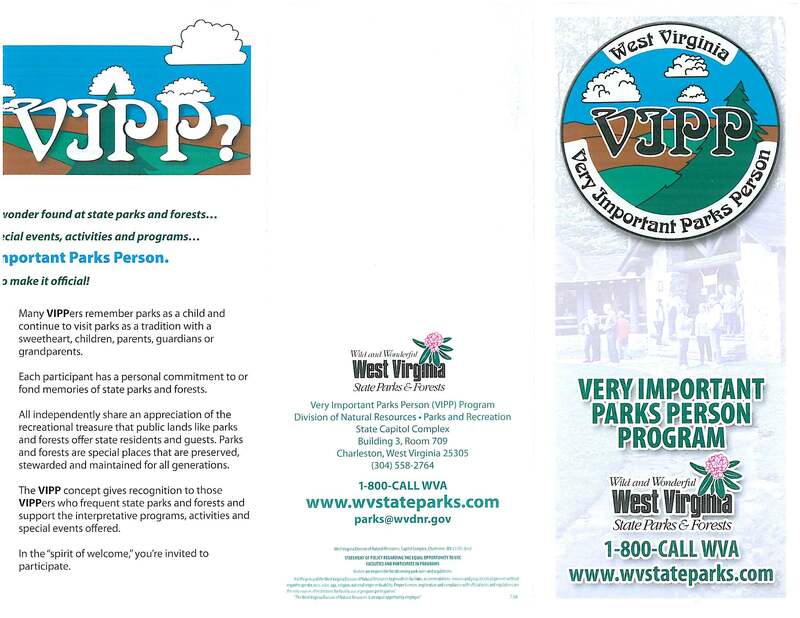 There is a VIPP (Very Important Parks Person) program in which you get a card from the State Parks in Charleston, WV. Write in advance. 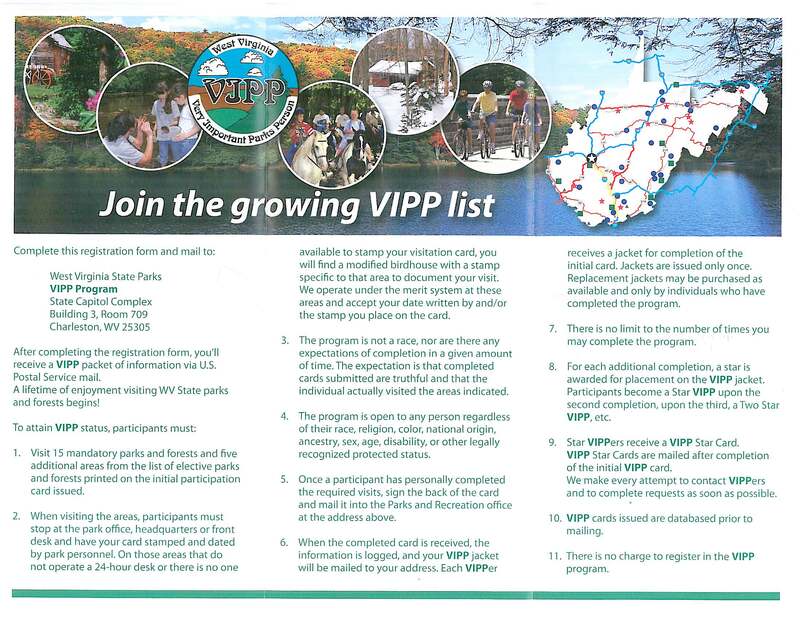 As you visit parks, look for the VIPP box which is usually just outside the main office’s front door. Stamp your card with the rubber stamp inside the box. Collect 15 required plus 5 optional stamps and you’ll get a free jacket! 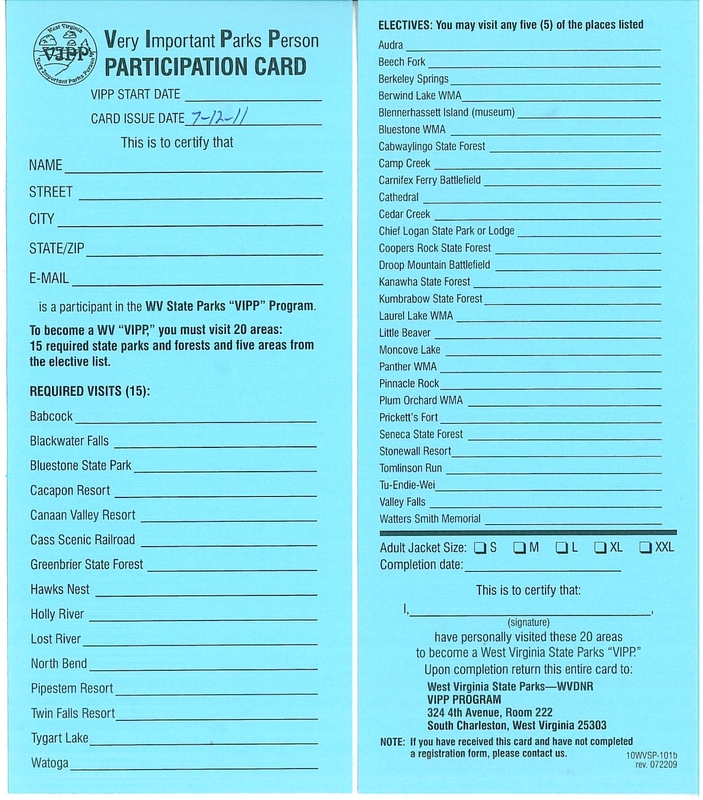 Get your card in advance of heading to WV. The airport at Charleston is about the easiest to manage anywhere! The luggage claim conveyor is probably 20’ from the car rental desks. They have about 25 car rentals at Enterprise each day, so you won’t be “lost in the crowd!” There is a tax of $10+ per day for rentals at the airport, so that can add up! The airport is on top of a mountain that was flattened out. It's really an amazing place to fly into. There's also a military operation at the airport, so it's interesting to see the aircraft there. If you’re going to stay in Parsons, WV, look up Irene's Place (www.irenesplace.com), the bed and breakfast run by folks involved in the local historical society. The rate is around $65 per night for a whole house! The geology of WV is very interesting: the Appalachians were created long ago as sedimentary rocks, then as the land rose and the rivers cut them, long, narrow, north-south mountains remained. Much of traveling this part of the country is going up to 4,000’ and then down to 2,000’. The rivers often flow north! That’s a really surprising idea for us! Several of the rivers flow north to ultimately join the Ohio River, then the Mississippi River to finally get to the Gulf of Mexico. Often river names change when they join! Thus the Blackwater and Dry Fork become the Black Fork after they join. The Black Fork and the Shavers Fork become the Cheat after they join! While the Cheat dumps into the Monongahela, where the Monongahela and Allegheny join, they become the Ohio River. What we (in the western US) know as a “pass” is called a “gap” in WV. What we call a river is a "run." The Pocahontas Demonstration Mine is in Virginia, but barely so. It’s definitely worth a detour! This is a walk-through mine because it had 12’ high coal seams. The tour led by a retired miner is quite good. The “exhibits” need a great deal of work! The Beckley Demonstration Mine is run by the city of Beckley. It’s a great tour of a much narrower seam that’s been opened up a bit so regular tourists can ride through in a “coal train.” The Beckley Mine operation includes a good, small museum and several restored buildings: a single miner’s cabin, a family cabin, the superintendent’s home , a school and a church – all well worth visiting. One of the best parts of the Beckley Mine tour is the opportunity to see and operate(!) a carbide lamp. I had seen these for decades, but never seen one operate. Not only that, the guide lets guests light and operate the lamp! The WV food item of note is supposed to be Pepperoni Rolls, a strip of pepperoni inside a baked bread wrapping. We didn’t find any, so will have to look for them on another trip. The Tamarack gallery that sells all sorts of West Virginia creations is an interesting building and has interesting stuff for sale. There is also a café that looked quite good and had some unusual offerings such as catfish. In the coal mines, it’s interesting to see the old shafts created by trees which rotted and were replaced by other minerals. These casts were quite dangerous to miners because they could suddenly slip down upon men in the mines. The New River Gorge Bridge is really interesting. At 880’ over the river (4 times the height of the Golden Gate Bridge), it’s really “up there.” The walk along the catwalk would be interesting, but at $74 or so, that’s too much. The trip down to Thurmond is a good one. The NPS rangers say don’t try to drive up the east side, although it shows on a number of maps. Park at the depot which holds the visitors’ center: do not drive to the historic buildings, walk instead. Thurmond is at lat / lon 37.957214 / -81.078954.
further upstream (to the right), but that's not the bridge you want. The bridge to Thurmond can be obscured by a parked train, as in this photo. The bridge is a great combined auto and train bridge. At the Grandview Overlook, there are really three different spots to stop to see the Gorge. The northern-most of the three has a very surprising cool air vent. The new Boy Scout camp is being constructed. You can get to the gate and get a photo, but that’s about as far as you can get! Look for this entrance near Glen Jean at lat / lon 37.924248 / -81.153148. This old bank building is a prominent feature of Glen Jean at lat / lon 37.928321 / -81155604.